The District of Columbia Department of Transportation opened in mid-December new 11th Street Freeway Bridges over the Anacostia River. The two new freeway bridges provide a seamless connection between the Southeast/Southwest Freeway (Interstate 395/695) and the Anacostia Freeway (Interstate 295/D.C. 295). Washington Mayor Vincent Gray, city councilmembers, DDOT Director Terry Bellamy, representatives from the Federal Highway Administration, and community leaders held a ribbon-cutting ceremony Dec. 16 to celebrate the completion, which occurred four months early. "Just two years after construction began, we have already arrived at this important juncture," Gray said in a statement. "This $300 million project -- the largest DDOT has ever undertaken -- is ahead of schedule and represents a giant step forward for our transportation system. Critical for connecting one city across the Anacostia River, these new spans will serve our residents, workers, and visitors for decades to come." 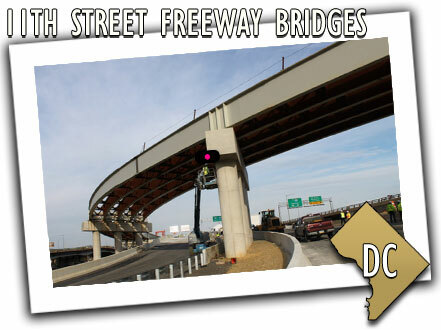 The 11th Street Freeway Bridges project is the first design/build bridge contract completed in the District of Columbia. "The design minimized the impact to traffic by putting the new bridges between the existing spans, and the construction is proceeding rapidly and within budget," Bellamy said in a statement. A third bridge for local traffic -- connecting Anacostia to Capitol Hill -- is still under construction and is scheduled to be completed by this coming summer. The local bridge will have a shared path for pedestrians and bicyclists as well as space for future transit. DDOT began construction on the 11th Street Bridge Project in December 2009 to replace the two existing bridges with three new bridges and improve the related interchanges. The old bridges were functionally obsolete and structurally deficient. The project employs close to 400 people. A second phase of work to improve the connections between the SE/SW Freeway and the 11th Street Bridges is scheduled to begin in 2012 and is expected to be completed in 2015. A Flickr photo gallery of the project is available from DDOT at bit.ly/DDOT11th.